. 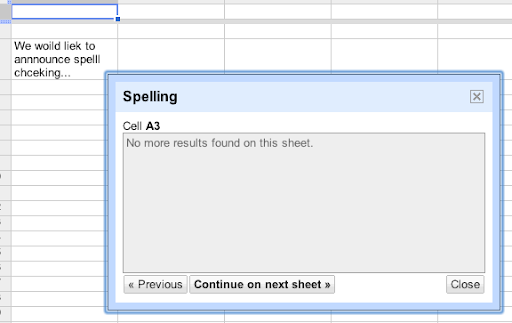 The tool will go through all the cells on your sheet, highlighting each cell which has a misspelled word in red. Words that might be misspelled in each cell are underlined in red and can be changed by clicking on them and selecting the right spelling. Click Next to go to the next cell and once all the cells on one sheet have been checked, you can continue to the next sheet. The ability to add words to your own dictionary is also coming. You can learn more about the spell checker here. Let us know what you think in the comments. 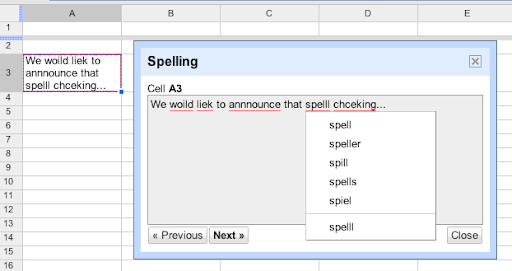 Correct spelling is an essential part of document creation and today we woild liek to annnounce that spelll chceking is now available in Google spreadsheets. To launch the new spell checker, go to Tools > Check spelling. The tool will go through all the cells on your sheet, highlighting each cell which has a misspelled word in red. 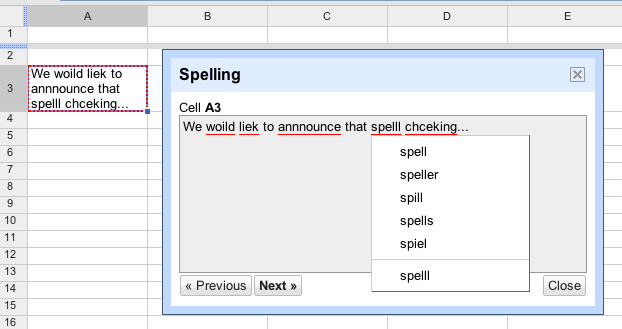 Words that might be misspelled in each cell are underlined in red and can be changed by clicking on them and selecting the right spelling.